Mobile ad network Millennial Media has formed a partnership with Mullen’s Mediahub unit that will give the agency early access to new ad technologies and formats from Millennial that will provide feedback to the ad network on new product development. Under the deal, Mediahub/Mullen will have an opportunity to preview new creative units and other Millennial ad products in the works, with the option of serving as a beta partner on new technology on behalf of clients. In return, the agency will provide consulting and insights that help Millennial shape new ad offerings. The mobile ad network will also provide custom data reports to track performance on all Mediahub/Mullen campaigns, along with regular cross-brand analysis to help the agency spot broader industry trends. Millennial entered into a similar relationship with MediaVest USA last November. “We’re always looking to bring new opportunities to our clients, and by partnering with Millennial Media, we’ll have the ability to get ahead of the curve and implement new technologies before they hit the wider market,” said Gina Preziosa, vice president, group digital media director of Mediahub/Mullen, in announcing the pact. 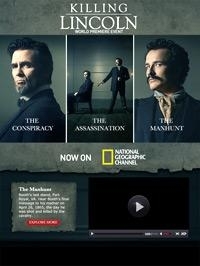 Earlier this year, the companies worked on a tablet-focused campaign promoting “Killing Lincoln,” the first original, fact-based drama produced by the National Geographic Channel. As a novel feature, video content in the ads updated as the program aired to provide a real-time experience. In that vein, Millennial last week introduced a new series of video ad formats geared to smartphones and tablets. 1 comment about "Millennial Media Allies With Mediahub/Mullen For Ad Tech". Anni Paul from BoscoSystems, June 30, 2013 at 2:37 a.m.
Smart move by both... Millennial Media has really rebounded from a rough first year as a public company. I still think they lag Airpush and even Tapjoy in the overall innovation/effectiveness category, but I still think it will be MM and not AdMob at the top of this industry in a few more years.